Anthuriums - More than Just Blooming Plants! While many folks think of colorful waxy flowers from Hawaii when the word "Anthurium" is mentioned, the genus Anthurium consists of a host of different plants, only a few of which produce colorful flowers. 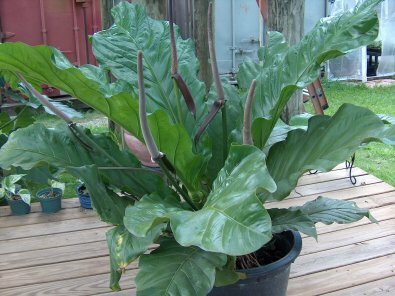 Here you'll find diminutive creepers, vines and even huge-leaved behemoths that remind one of the larger Alocasia plants . . .
As the largest genus in the aroid family, you'd think that most people would be familiar with a variety of Anthurium species, but the reality is that most people think of the blooms of only a couple of the approximately 1000 species when their hear the genus name. The "Flamingo Flower", Anthurium andreanum, is one of the parents yielding a kaleidoscope of colorful hybrids that are used as cut flowers around the world. However, the great bulk of plants in this genus have more or less inconspicuous blooms that would scarcely be noticed by the casual observer. Many do have very interesting and/or exotic leaf shapes, textures and colors which are desirable as foliage plants for this reason. In addition to beauty of foliage, many also produce very colorful berries ranging from neon red to orange, cream, yellow, blue and purple. Anthurium species are found growing in a diversity of habitats, ranging from terrestrial to climbing or sprawling on rocky outcrops, to growing epiphytically on trees. They can be found from low altitude tropical locations to higher altitude cool cloud forests. A number of species are resistant to chilling injury, being able to withstand bouts of near-freezing temperatures without damage, while others begin to show damage when temperatures reach the low 50s F. Some species grow best in drier habitats and actually suffer if kept too moist. Two of the better-known groups of Anthurium plants are the rosette or "birdsnest" types (see picture at left) and the silver-veined species. Both groups have been used in hybridization to a greater or lesser degree; the birdsnest types being especially prone to natural hybridization. Because of this, birdsnest types are very easy to come by, and if you grow one to a mature size, you are likely to obtain copious amounts of berries to start many more of your own from. The silver-veined types, such as A. clarinervium, are not quite as common but are available. Birdsnest Anthuriums are one of the most easily grown of the groups, but often require quite an amount of growing space. A few birdsnest types grow more upright than spreading, making them easier to fit into a crowded collection. These plants are not often found in big box stores, however, so your best bet at acquiring one is to find a fancier who has extras to sell or share. The most familiar of the silver veined types is A. clarinervium (see picture at right). I saw my first example of this plant over 30 years ago and was amazed at the sight of it. 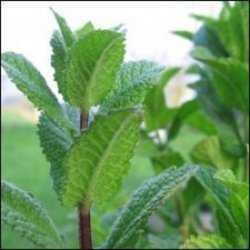 The leaves are velvety dark green with silvery main veins that even sparkle a little in bright light. Newly emerged leaves have a brownish or reddish tint to them. 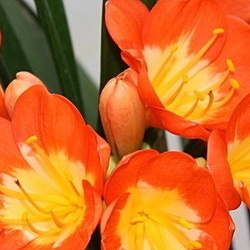 They are best grown in low to medium light with very well draining soil and warm temperatures. This type of leaf is found in a number of other species, such as A. crystallinum and the spectacular A. warocqueanum, with long strap-shaped pendant velvety green leaves and the silvery veins. Perhaps the most stunning example of this group is A. regale, a plant that is not easy to grow, but when grown well, can have very impressive leaves over three feet long and two feet wide. Be sure to check out the pictures at the link provided because this plant is truly a show-stopper. I have some in my collection but they have not yet approached the formidable look shown in the pictures. Because of the intriguing beauty of these plants, enterprising hybridizers (including myself) have attempted to mix them up with other species. The obvious cross is to mix them with the A. andreanum hybrids in an effort to get a silver-veined plant with colorful blooms. I did this cross and got it to work (see link here), but the results were underwhelming. The velvety look and silver veins were muted and the bloom, while colorful, was nowhere near the size of the cut flower type of bloom. Still hopeful, though, I and others continue on the quest for beautiful and easier to grow plants with looks such as these have. 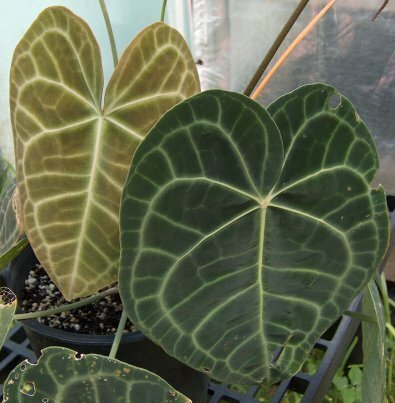 Besides the groups mentioned above, you can find Anthurium species with palmately divided leaves (see thumbnail picture above), many different heart shapes, ovals, T-shapes and others in a variety of textures from smooth to glossy, bumpy, very wrinkled, paper-thin to thick and leathery. 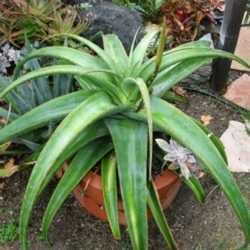 Amongst all this variety, you are sure to find one or more that will make excellent additions to your plant collection. Winter-blooming Indoor Plants Keeping your plants in "mint" condition - and keeping rodent damage out! Monocots versus Dicots- what's the big deal?